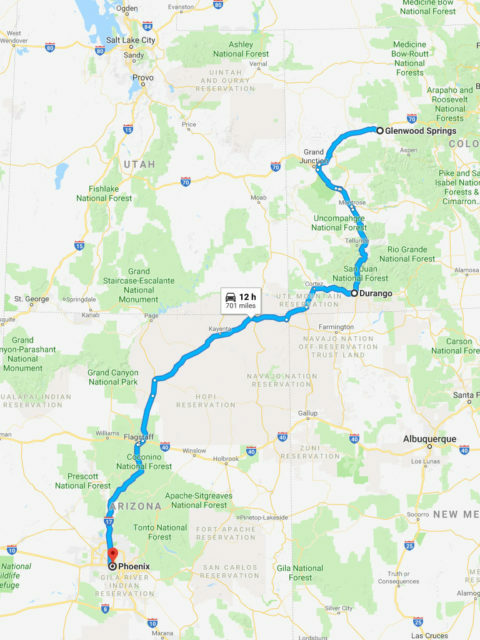 In July of 2008, my dad announced that he was planning a road trip to Colorado and back. The idea was to visit Glenwood Springs and give his tired bones a soak in the natural hot springs for which the town is named. Knowing full well what a road trip with the old man would entail, I carefully weighed my options. Go along and take some pictures, or stay at home and do nothing? I chose Colorado. His original plan was to rent a car for the trip, but he scrapped that idea to save money. We made the trip in my mom’s 2004 Chevrolet Cavalier sedan instead. Although the car was in good shape, it wasn’t as fun as a rental vehicle would have been. It was crowded with two people and too much luggage, but the car got us there and back safely. Our journey began on a Monday in July. Unlike most of our family road trips, this one got off to a pretty late start. Dad had a flat tire the previous day and needed a new one before we could leave. We finally got going about 9:30am with me behind the wheel. Just two hours later we were breathing in that clean mountain air as we stopped in Flagstaff for an oil change and grabbed lunch at Wendy’s. 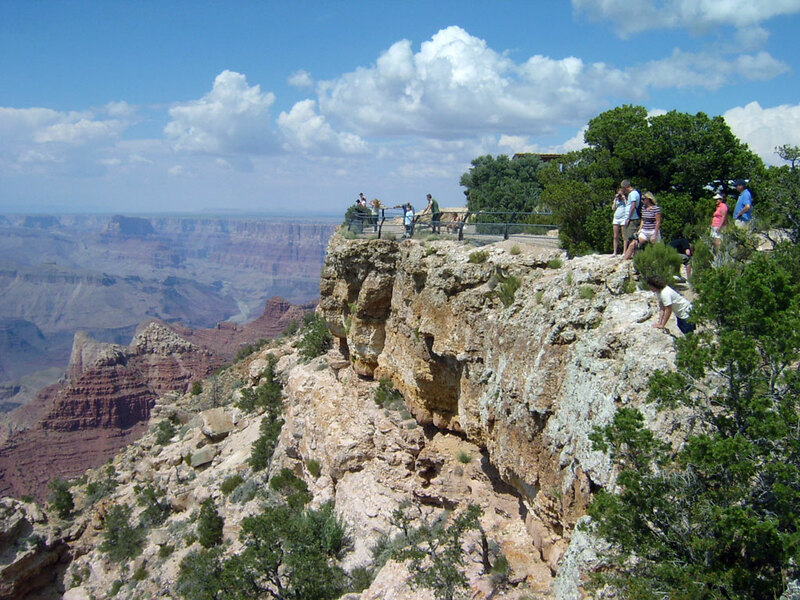 There wasn’t time to hang around in Flagstaff because we wanted to get to the Grand Canyon as fast as possible. 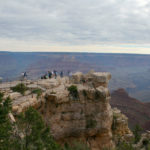 I was feeling good as we headed up US Route 89 to Cameron, AZ and took Arizona Route 64 to the South Rim of the Grand Canyon. 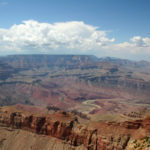 I wasn’t sure what to expect as we entered Grand Canyon National Park at about 2 o’clock. 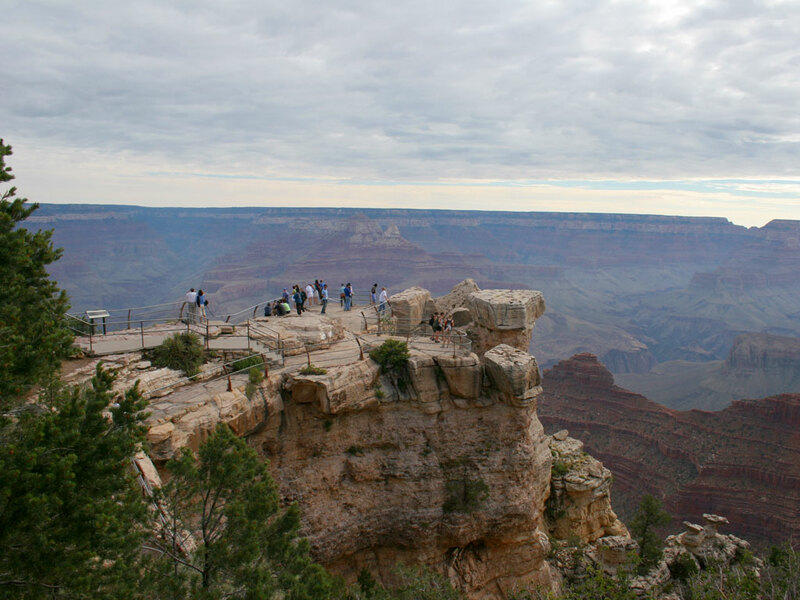 It had been a very long time since I had been to the Grand Canyon, and it was my first time driving there. The ranger gave us a map of the park and we stopped at the first overlook with great anticipation. 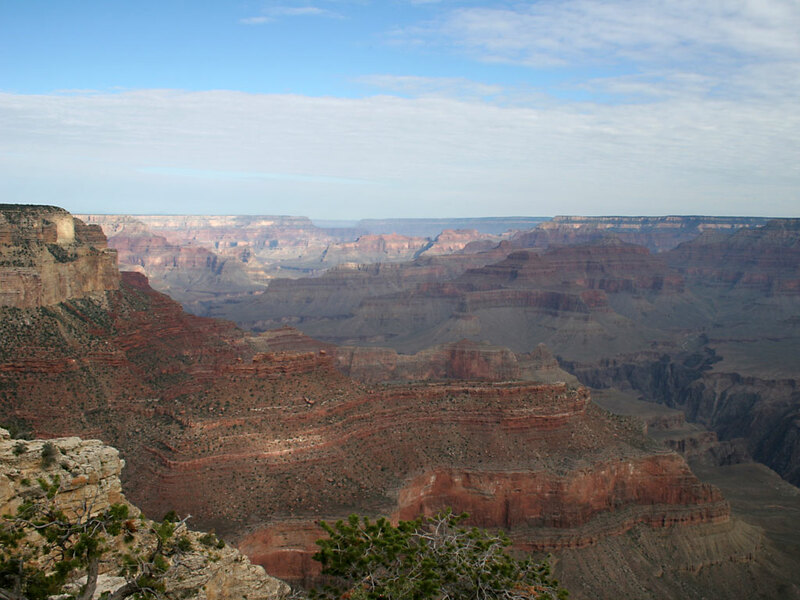 View of the Grand Canyon from Desert View point, South Rim. The first of nine official Grand Canyon Viewpoints was called Desert View. Right away I noticed was how much cooler the temperature was at 7,000 feet elevation. Even in the middle of summer, the air temperature was very comfortable and there was a nice breeze. The sun felt very strong, so I stopped to apply plenty of sunscreen on my face and arms. 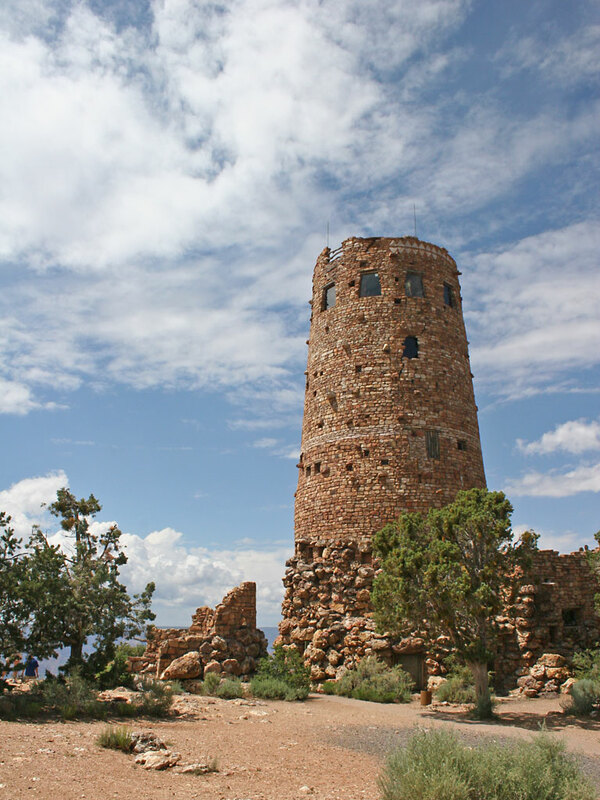 We spent some time taking photos and checking out the Desert View Watchtower before moving on to the next viewpoint. Desert View Watchtower, built 1932. We decided to visit every other scenic viewpoint on the way in and visit the rest of them on the way out of the park the next morning. This turned out to be a great idea because we could skip the ones that were too busy during the afternoon and catch them first thing in the morning when they would be empty. 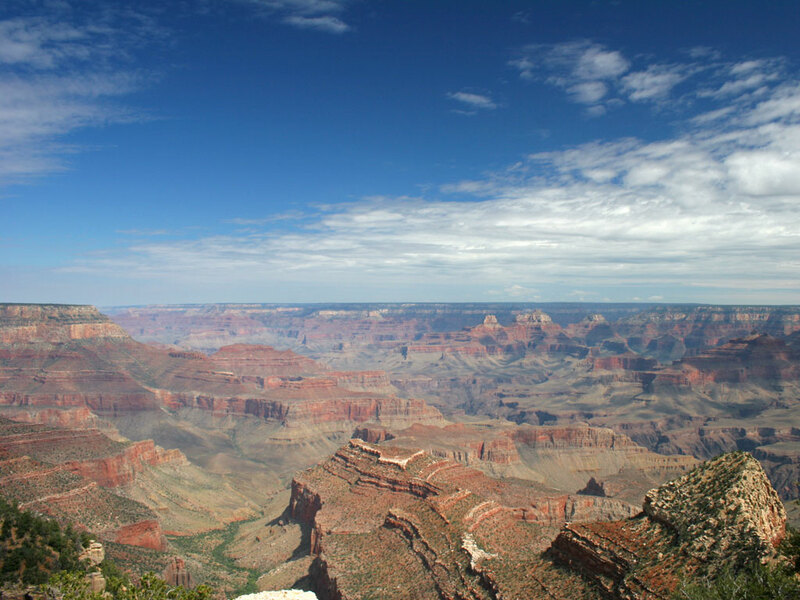 Each viewpoint provided us with a fantastic new perspective of the Canyon, and there were countless great shots to be had. I was having fun shooting lots of pictures of the Canyon. 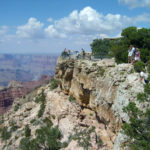 By 4 o’clock we had made our way to Grand Canyon Village where we checked into the Yavapai Lodge. 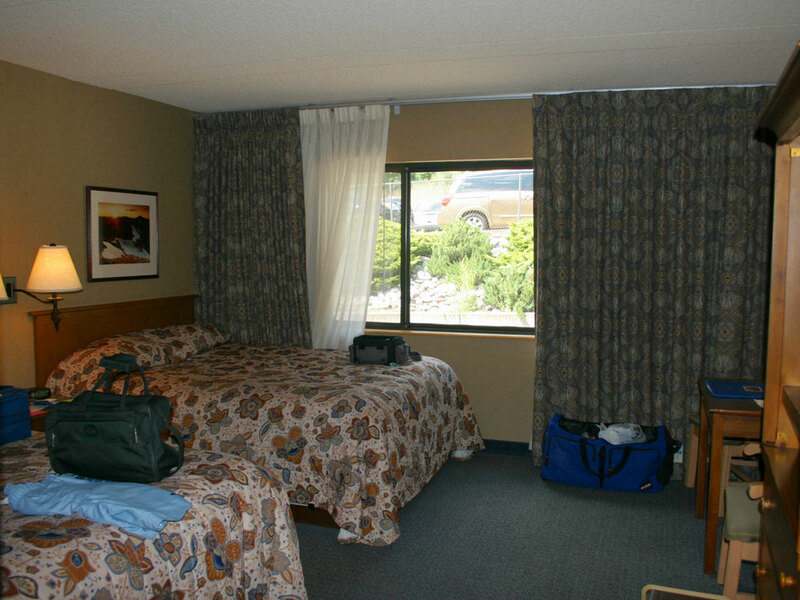 Room #7121 was a small room with two beds, a bathroom, and a window. The sparsely decorated room and painted brick walls reminded me of those “luxury” federal prisons I’ve seen on television. Dad was furious that our room did not have an air conditioner, even though the temperature was a very comfortable 68°F. We had dinner at the El Tovar Hotel (built 1903) at the South Rim of the Grand Canyon. 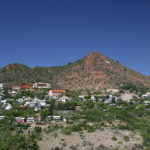 After getting settled, we rode the free shuttle bus to the El Tovar Hotel where we walked around and admired the canyon some more. We had steaks for dinner and watched a storm roll in from the large windows of our restaurant. As the sun went down, a dense cloud of fog formed over the canyon and the North Rim disappeared from view. It began to rain as soon as we boarded the shuttle bus back to the hotel. There was a herd of elk visible from the bus and everyone went wild trying to see them. The first day of our trip was pretty easy. There wasn’t too much driving or walking and the worst I had to endure was dad’s constant chattering all day long (which got old very fast). We got to bed early knowing that the next day would be much longer. 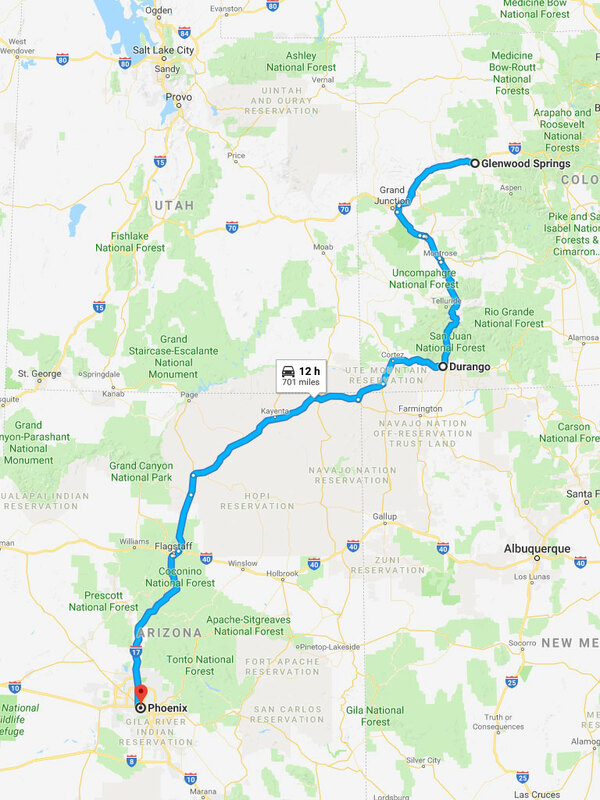 We still had a lot of driving to do before we would get to Colorado. Morning came much too soon and I had not slept well. We ate a hearty breakfast of eggs, bacon, and pancakes at the Yavapai Lodge cafeteria before heading out. After breakfast, I started to feel much better. We stopped at the rest of the scenic viewpoints which were spectacular in the early morning light. Dad was ecstatic with all of the ground squirrels at Grandview Point. He continued chattering away as he drove from the Grand Canyon to Kayenta, Arizona. Morning light at the Grand Canyon. I think he must have been determined to make the drive to Kayenta as excruciating as possible. He tuned in to a Navajo radio station for an extended period of time, though neither of us could understand it. He also stopped to see the famous “Dinosaur Tracks” on the way. A high school aged Navajo boy guided us around the strange landscape that looked like the surface of Mars. The kid pointed out large tracks preserved in the mud as well as fossils, shells and other evidence of prehistoric life. 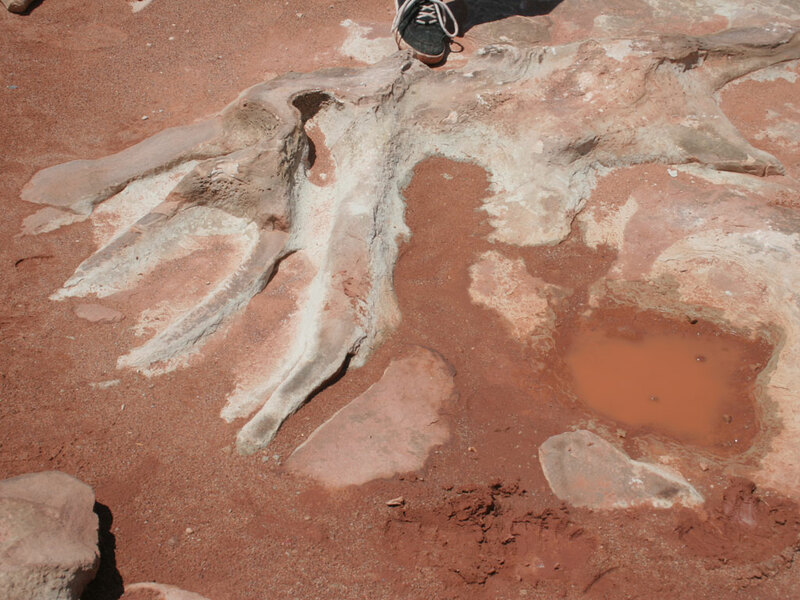 Okay, so the dinosaur tracks were not as lame as I had expected. I was surprised by how informal everything was; there were no ropes or barriers to prevent us or anyone else from damaging the historic artifacts. Dad generously gave our guide $20 dollars and thanked him for showing us around. We stopped for gas in Kayenta and I took over behind the wheel. As we entered Colorado, dad was becoming very critical of my driving. I tend to be very cautious, and he tends to have a lead foot. He complained that I wasn’t going fast enough and was nagging me to pass a large truck on a two-lane road. Frustrated, I punched the gas pedal to the floor and blew by the truck at close to 100 mph. I could see his hands gripping the seat tightly as he told me to “Slow the hell down!” He didn’t nag me to pass anyone else after that! We didn’t stop again until we pulled into Durango, Colorado. I spotted an awesome motel sign and pulled over to take a photo. Dad was not happy with this unscheduled stop and jumped behind the wheel in the blink of an eye. We got some snacks at a gas station and I noticed they stocked some food items we didn’t have back home. I tried an orange creme soda that came in a glass bottle. It was good and had a nice smooth flavor. Now Dad’s driving was now beginning to get on my nerves. We drove through a construction zone where the pavement had been ripped up. We were driving over loose gravel and dad was following the car in front of us very closely. Rocks kept hitting our windshield and I had to yell at him to back off a little. I shouldn’t have needed to tell him that, but it was clear he was just going to keep complaining about the rocks instead of being sensible. I didn’t want to bring mom’s car home with a cracked windshield. 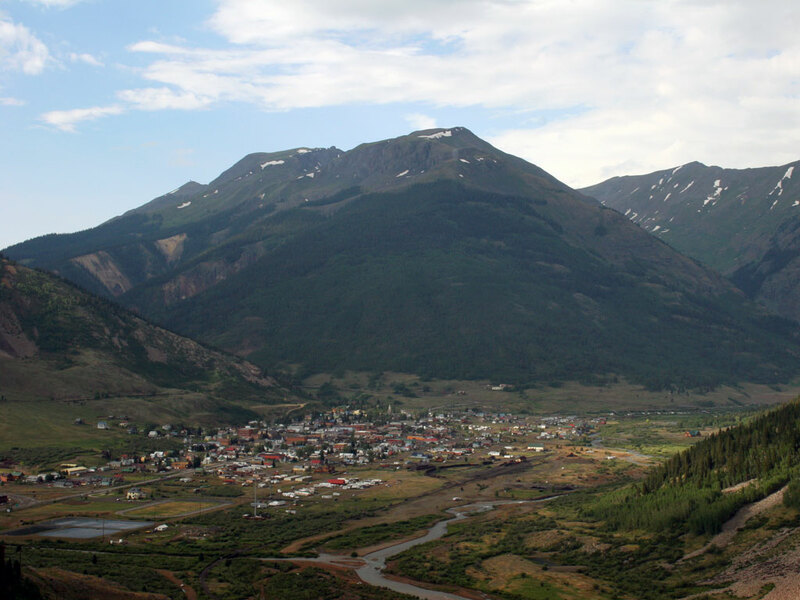 The next town on the map was Silverton, Colorado. We had both been there on previous trips, but always via the narrow-gauge scenic railroad from Durango. This was our first time actually driving Durango to Silverton. The road between the two towns is known as the “Million Dollar Highway.” With a name like that, I was hoping it would be a spectacular drive. 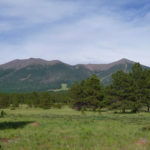 The winding, two-lane road started out by climbing a couple of mountain passes some ten and eleven thousand feet high. 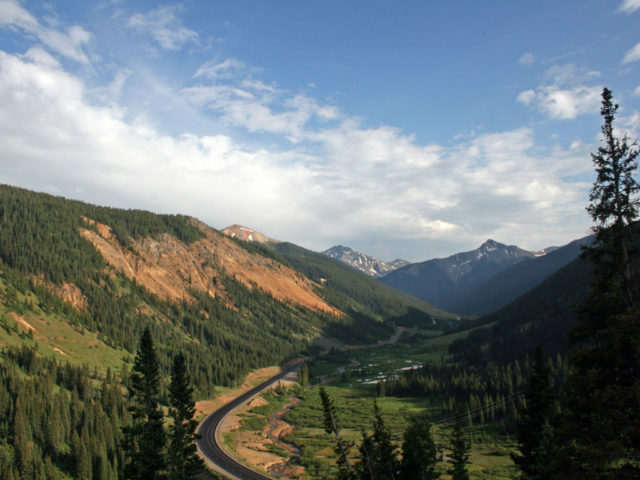 We drove over Coal Creek Pass (10,600 ft), Molas Pass (10,910 ft), and Red Mountain Pass (11,000 ft). The road leading up the mountain was dotted with dozens of ski resorts along the way. The scenery was absolutely gorgeous! The road was not too crowded and we had plenty of time to soak up all of the mountain vistas, which had some pretty great colors. We made it to Silverton and stopped at a gas station to double check that the road we were on would take us to Ouray. I could smell the freaking brakes – they must have been completely overheated. Dad mentioned the smell to the gas station attendant who told him to use lower gears! He had to hear it from a stranger instead of me before he would believe it. Eventually, we made it to Ouray and found the Comfort Inn where we had reserved a room. Once we had carried our bags up to room #201, dad cranked up the air conditioner and we went to look for something to eat. We found a sports bar along the main road where we ordered a pizza and hot wings. The hot food improved my mood tremendously (and it was delicious, too!). Once again, I slept restlessly and felt tired when it was time to get up. The hotel had a free continental breakfast that was better than most, and we ate well before checking out. 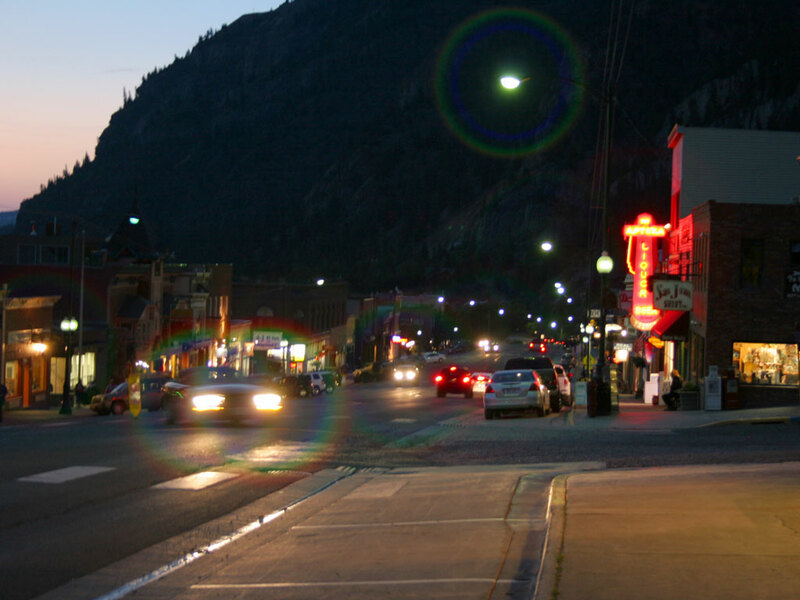 Today I would get to see what the town of Ouray was all about. Some of the travel brochures in our hotel room called Ouray, Colorado “the Switzerland of America.” When you think about it, they are both nestled high in the mountains and thrive on tourism and skiing. 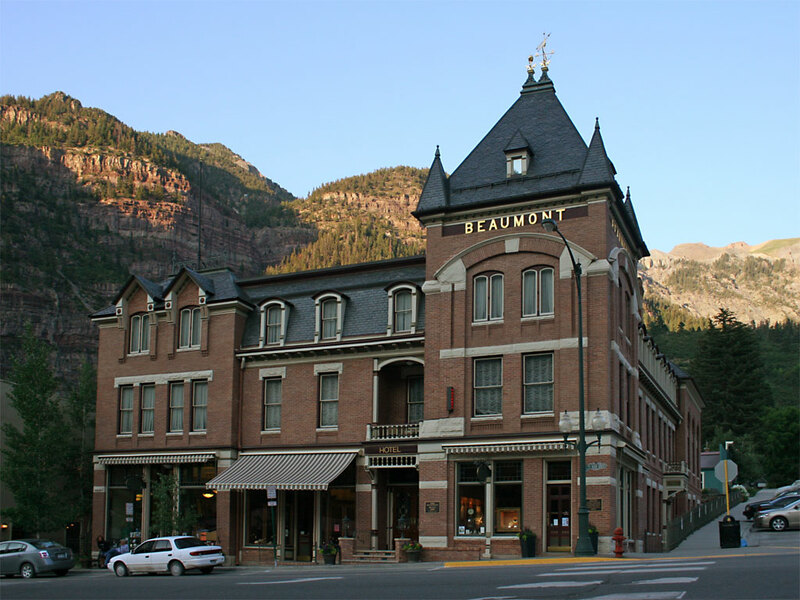 The buildings in downtown Ouray looked very old fashioned, like what I imagine Switzerland looks like. There was a Toyota FJ jamboree in town that week, which was a very big event from the looks of it. Everywhere you looked there were Toyota 4×4’s, from the classic FJ40 to the new FJ Cruiser. Every single one of them was covered in mud and driven by some guy with a huge smile on his face. The whole town was crawling with Toyotas! Dad and I started the day by checking out Cascade Falls, a giant waterfall just a few blocks off the main road. We parked the car and hiked about 1/4 mile uphill to the falls. It was not an especially steep hike, but I felt tired more quickly than usual due to the elevation. The falls were coming from a cliff of such great height that the water was like a heavy mist at the bottom. You could get as close as you wanted to the base of the falls, but the idea of getting soaked at 8AM did not exactly thrill me. From there we drove to an even bigger waterfall called Box Canyon Falls. 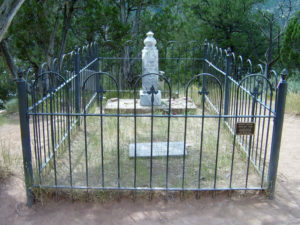 The cost to visit this one was $3 dollars per person. Visiting the upper part required climbing several flights of stairs that seemed to go straight up. 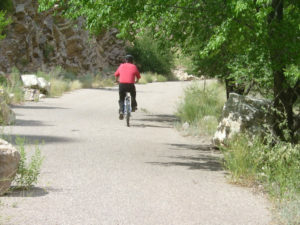 The 500-foot trail gained 200 feet of elevation, which made for a very steep climb. At the top there was a small bridge that crossed over the box canyon. 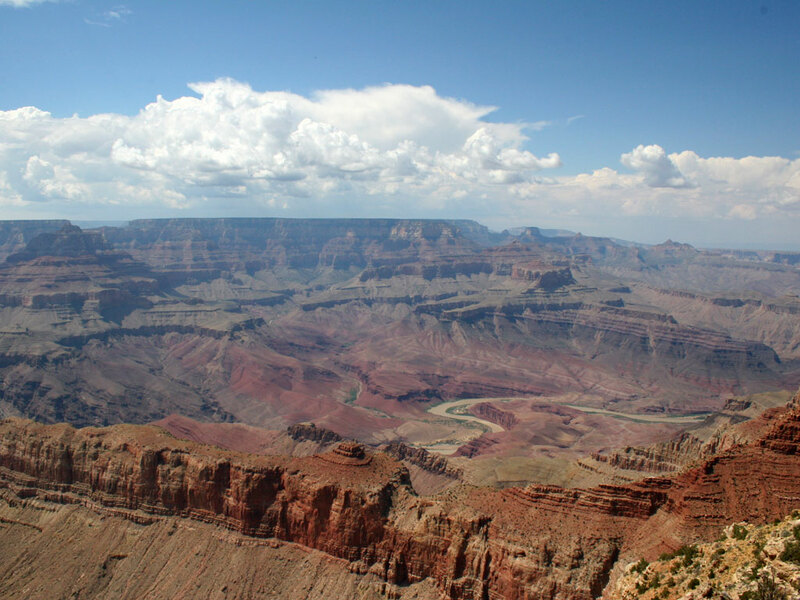 The canyon was very deep but not especially wide, and the water seemed to be miles below us. After taking some pictures, we ventured down to the base of the falls where we found the real action. 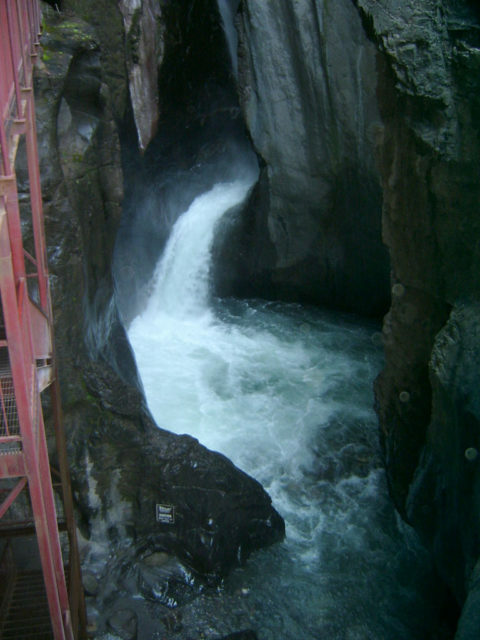 The force of rushing water crashing through the narrow canyon could be heard long before the falls came into view. A metal walkway directed us to a flight of rusted stairs that ended at the water’s edge. It was cold, loud, and totally awesome! 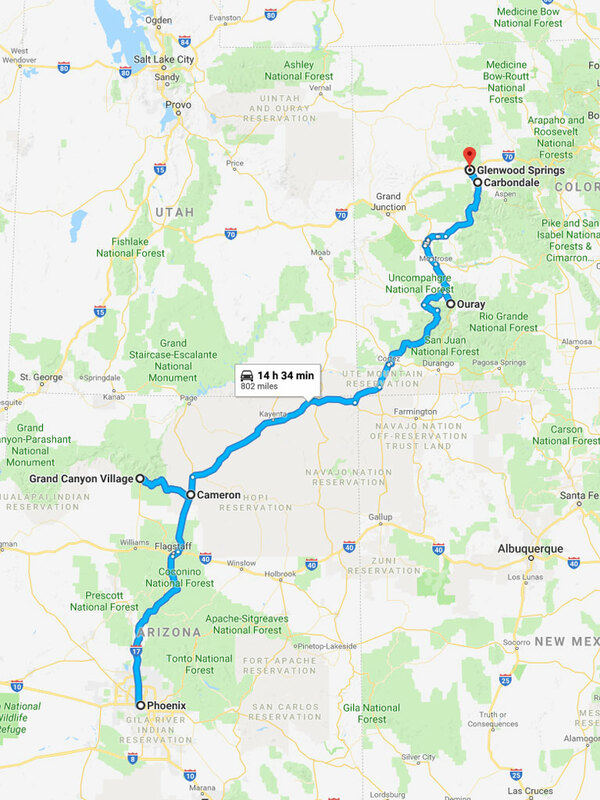 We left Ouray just before 10AM, and I drove from there to Carbondale, Colorado. The drive was long but not difficult. Carbondale gave me some weird vibes and I was glad to get out of there after we changed drivers. I don’t know what it was, but the town didn’t seem to have a beginning or an end. The sky was overcast and there was a weird smell like diesel fuel everywhere. 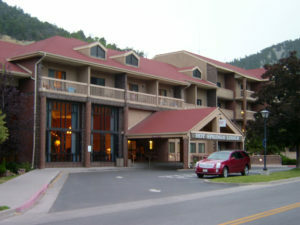 Dad drove the last stretch to Glenwood Springs where we checked in to the Hot Springs Lodge. 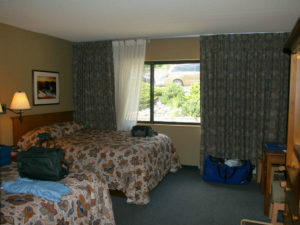 Room #336 was very plush with thick carpeting and huge comfortable beds. I connected my ancient laptop to the Ethernet jack in the room, which was far better than the crappy wireless Internet connections I had used so far. There wasn’t much time to surf the web though, because dad was eager to get down to the hot springs. We put our swimsuits on and walked over to the hot springs. Conveniently enough, they were directly across the street from the hotel. 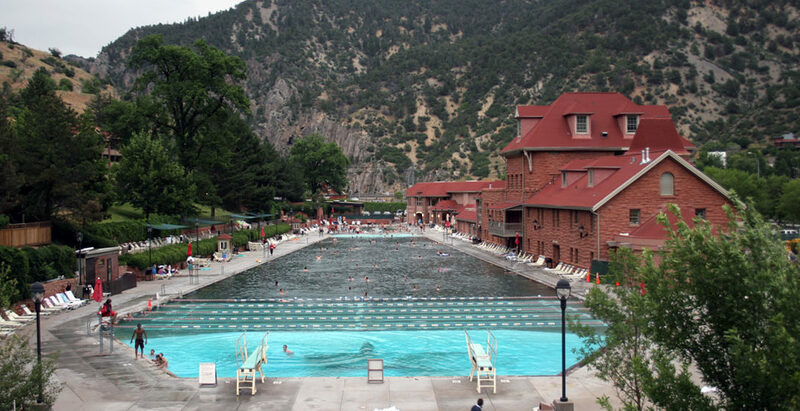 The Glenwood Hot Springs are accessible through a red sandstone building that dates back to 1890. 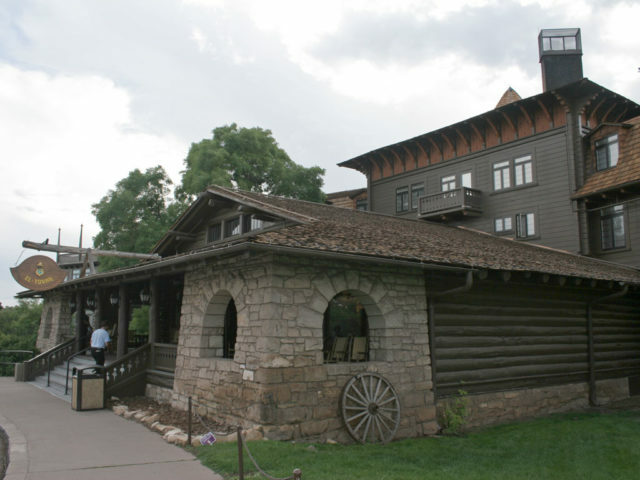 Back then it was the original Hot Springs Lodge. Today it houses the spa, fitness center, bathhouse, and gift shop. With our hands stamped and towels in hand we headed outside. 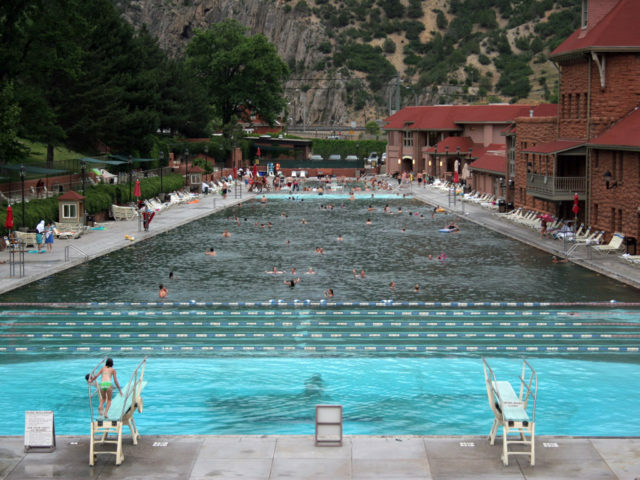 Glenwood Hot Springs is the World’s Largest Hot Springs Pool. The water is 90° F / 32° C and comes from an underground spring. The odor of sulfur in the air was noticeable, but not overwhelming. For some reason, I had expected the hot springs to be little more than a glorified swimming hole. I imagined the place would be quiet and pretty empty on a weekday. Someone should have told me that Glenwood Hot Springs is world-famous for being the largest natural hot spring pool on earth! As I surveyed the pool area, two things became apparent: I was totally wrong about the size of the place and about how busy it would be. Not only was the place packed on a weekday, it was huge! Everywhere I looked there were large groups of retirement-age folks and families with small children. I could count on one hand the number of people who were my age. Just like the Alaskan Cruise, I was probably the youngest person who chose to be there. The smaller “therapy pool” is just barely visible beyond the main pool. There were two pools, a smaller one and a larger one. Both of the pools did not look anything like a natural hot spring. In fact, they were perfectly shaped rectangles with non-slip decks. They also had hand railings, steps, and benches. Apart from the size and the gray-colored water, they looked like every other public pool I had ever been to. Warm water bubbled up from holes in the bottom of the pool, and I wondered how the pools are filtered. The smaller pool was known as the therapy pool, and it was about 104°F. I could only stay in a short while before switching to the other pool which was both larger and cooler at 98°F. 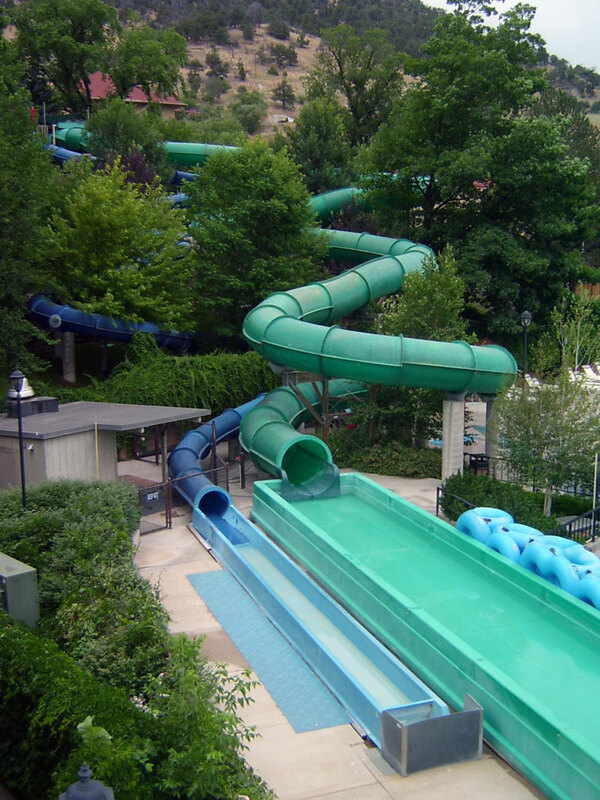 The west end of the big pool was divided into lanes for swimming laps and there was a water slide at the far corner. The therapy pool had some coin-operated bubble chairs which dad and I tried out. We swam until we were wrinkled, and then went in search of dinner. We found a little restaurant called The Italian Underground not far from the hotel and waited a full 30 minutes for a table. The place was literally a basement and there was nowhere to sit as we waited. Once we were seated though, the food and the service were excellent. Went back to the room and I barely had time to check my email before crashing in the gigantic bed. For the first time on the trip I woke up feeling very well rested. We ate the continental breakfast that the hotel provided, which was across the street in the pool house building. Everyone was using these very tiny cups near the juice dispenser for their juice, but I grabbed a larger sized cup from the coffee machine and enjoyed a regular sized cup of orange juice with my breakfast. We began the busiest day of the trip with another dip in the hot springs. The smell of sulfur sure wakes you up in the morning! 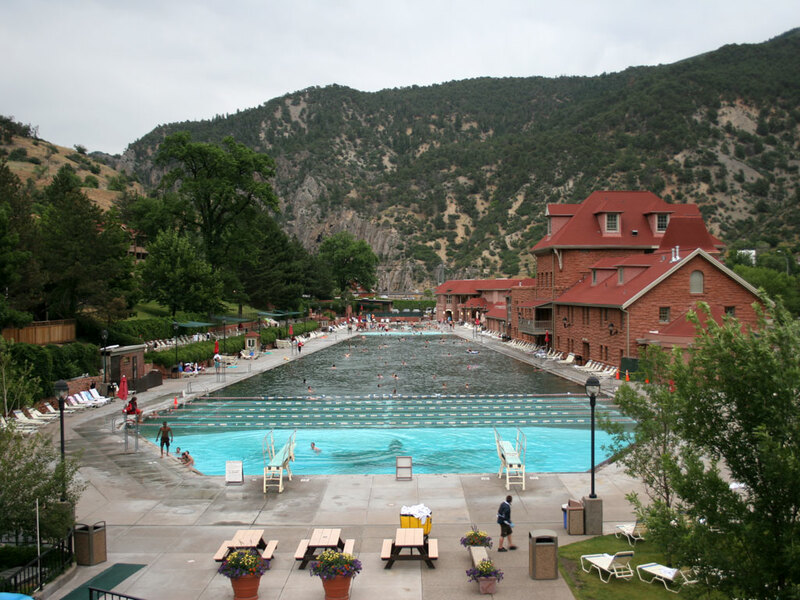 After swimming, we checked out of the hotel and drove to Glenwood Caverns Adventure Park. 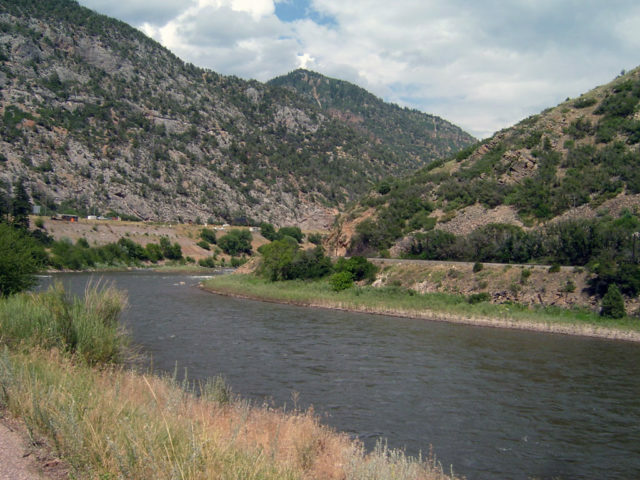 Because Glenwood Caverns is located on top of a mountain, visitors must enter via tram ride. 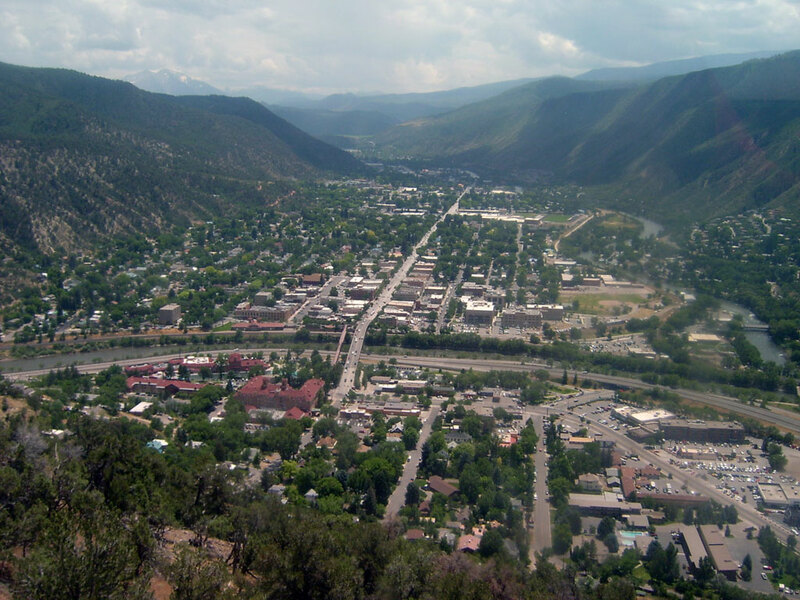 As we rode the tram 4,300 feet up the side of Iron Mountain, we were treated to a fantastic view of Glenwood Springs. The main attraction at Glenwood Caverns is the caverns themselves. 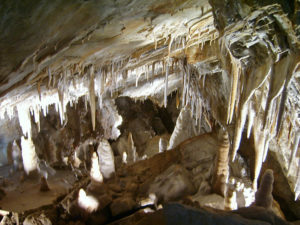 The park has a one hour guided tour that covers both the upper and lower rooms. Dad chose to sit this one out, so I went on the tour by myself. The upper room was alright, but it wasn’t anything special. 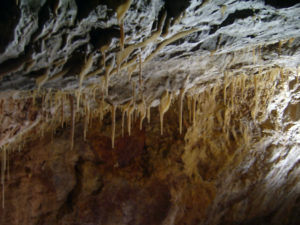 The trail led through the mountain to the other side, and came out at “Inspiration Point.” The second room had all of the good stuff, like the “soda straw” formations and a huge room with dramatic lighting. It was awesome! Dad and I purchased tickets for the Alpine Slide, which got me very excited. I had ridden an Alpine Slide once before in New Hampshire, at the Attitash Mountain Resort near Mt. Washington. I was eager to feel the rush once again. We got in line and I watched the people in front of us get into the carts. 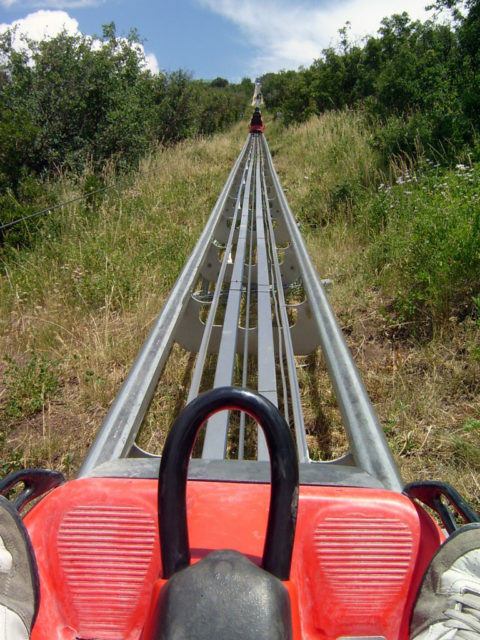 My only prior experience with alpine slides was the ride in New Hampshire, which was a very old ride. That one had plastic carts which went along a smooth concrete track, much like a bobsled. With only a handbrake for control, it was possible to launch your cart off the track if you weren’t careful. The Glenwood Springs ride was much newer and safer. The carts had seatbelts and padding and were fixed to a railroad-like track. There was no chance of flying off and getting hurt if you misjudged your speed going into a turn. It may has well have been a Volvo on rails. I realized that because the cart was attached to the track and because I was strapped in to the cart, the handbrake would not be necessary at all. I set off down the mountain and was picking up speed with every corner. Just as things were getting really fun, signs along the track warned riders to slow down. There was a lift mechanism to bring the carts back up the hill. The last minute or two of the ride was scenic and peaceful. The ride wasn’t what I expected, though it was safe and still pretty fun. Dad and I left the park at 1 o’clock in the afternoon and ate lunch. 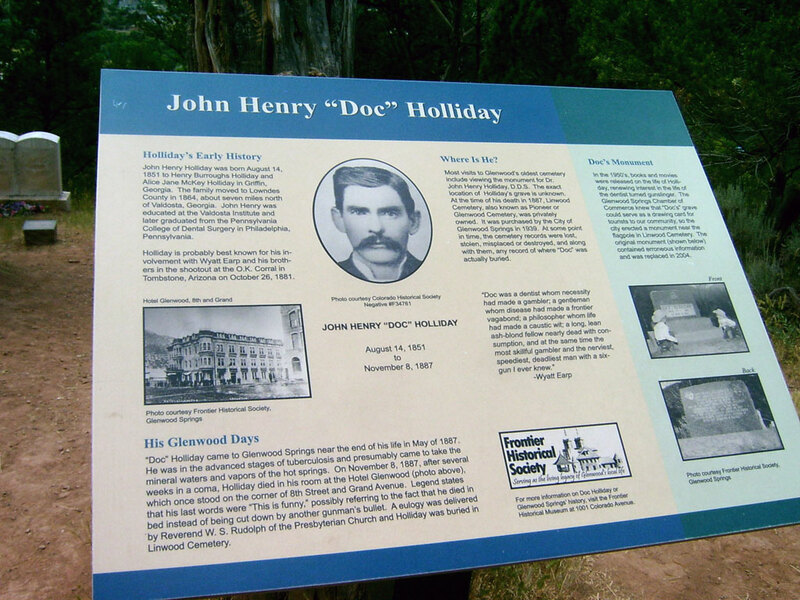 I was feeling very full as we drove towards our next adventure: the Linwood Cemetery, where famous gunfighter John Henry “Doc” Holliday is believed to be buried. 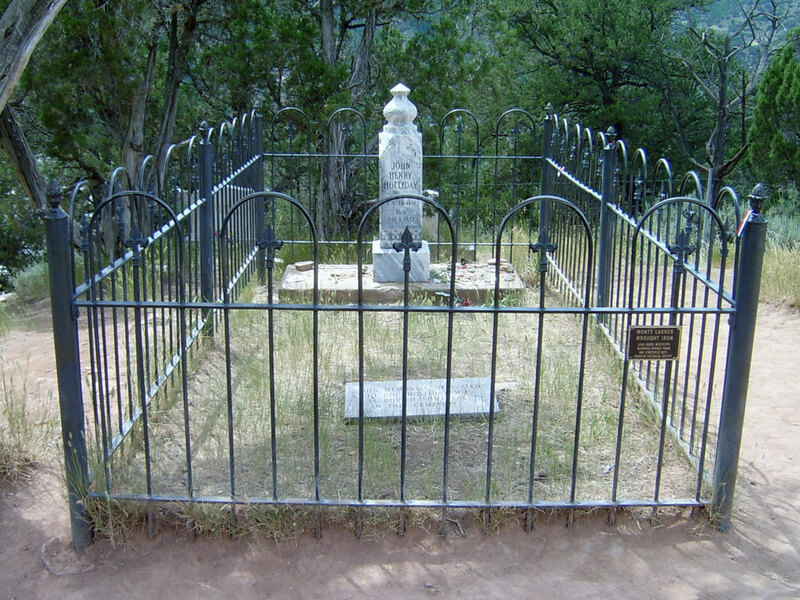 I say “believed” because the location of his actual grave is lost to history, but the Frontier Historical Society has evidence that he is in there somewhere. 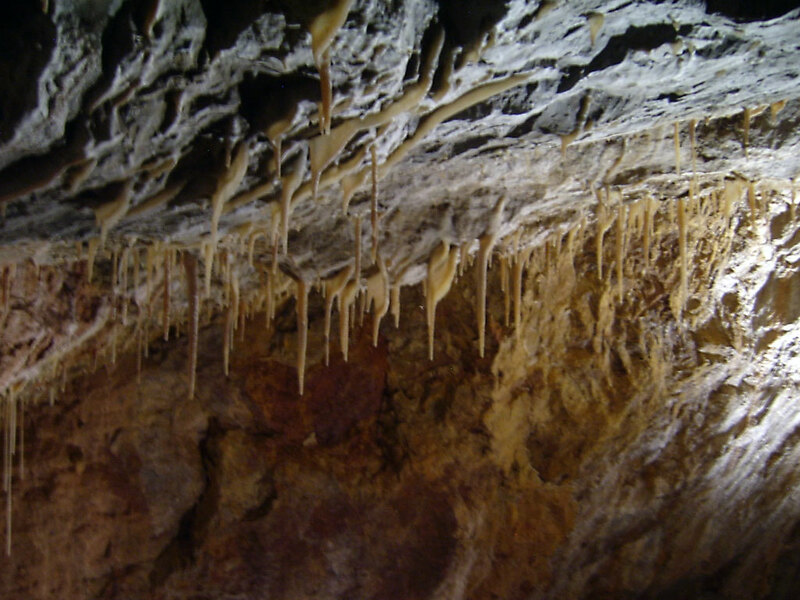 Unlike the Caverns, the cemetery does not have a tram ride to take you to the top. It was a good steep hike, especially after you’ve just eaten. We located the Doc’s grave, but the batteries in my camera were dying and I could not take pictures of any other memorials. 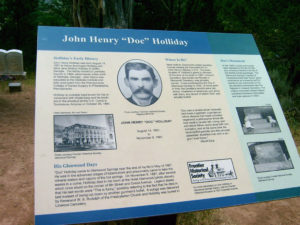 I noticed that someone had scratched “Rest in Peace Doc” into the fence surrounding his headstone. Other visitors had left the Doc some mementos like coins and playing cards as a nod to his notorious gambling career. We trekked down the mountain and drove back to the hotel, where I was looking forward to resting a bit. On the other hand, dad was ready to keep going! He was adamant about renting some bikes from the bike shop near our hotel. Less than an hour after hiking down from the mountain, we were pedaling along the bike path that parallels Interstate 70 and the Colorado River. The bike rental shop set us up with a pair of “Giant Sedona DX” mountain bikes with 24-speed Shimano drivetrains. The huge 26″ wheels and front suspension were surprisingly easy to get used to. This was like the Sport-Utility Vehicle of bikes compared to my 20″ BMX bike. I was starting to figure out which gears worked best for climbing hills and which gears worked best for flat terrain. Dad seemed to be struggling with the shifters and was pedaling furiously. We climbed a couple of strenuous hills and I was out of breath after the second one. Some kind soul had placed a cooler full of Gatorade bottles at the corner of their lawn for passing cyclists. We dropped a couple of bucks in the donation jar and I took a long drink of the purple beverage. We followed the paved trail for 5 miles and came to a rest stop where lots of other cyclists had stopped for a bathroom break. This was our turnaround point, and we started heading back after sticking our hands in the Colorado River. I’m not exactly out of shape, but I’m not used to riding ten miles a day either. 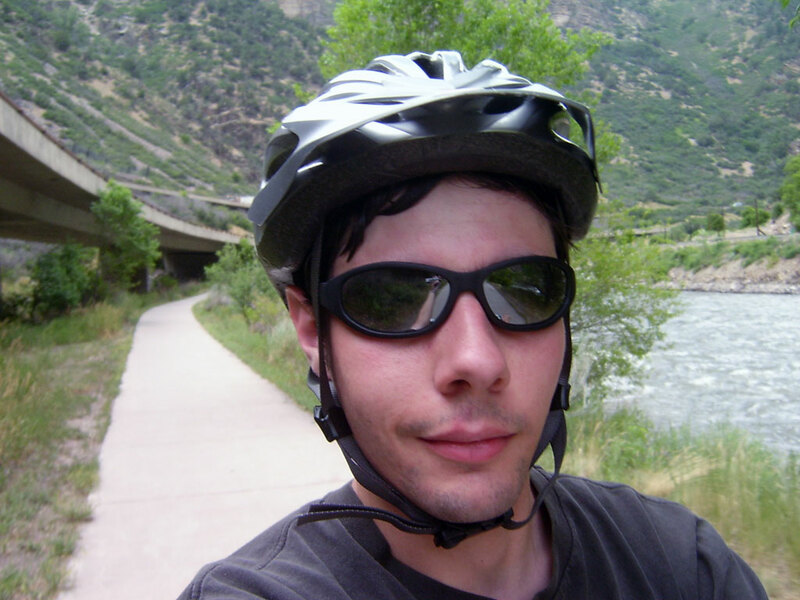 When we turned in our bikes, my face was on fire and I was covered in sweat. I was ready for a cool shower, but we had to get to our hotel room first. Dad had only booked one night at the Hot Springs Lodge because it was $180 dollars a night. He had spent a ton of money on the trip so far, especially with gas ranging from $4.03 to $4.75 per gallon. I wondered why he wanted to go on this trip so badly when we have a hot tub and bikes at home. 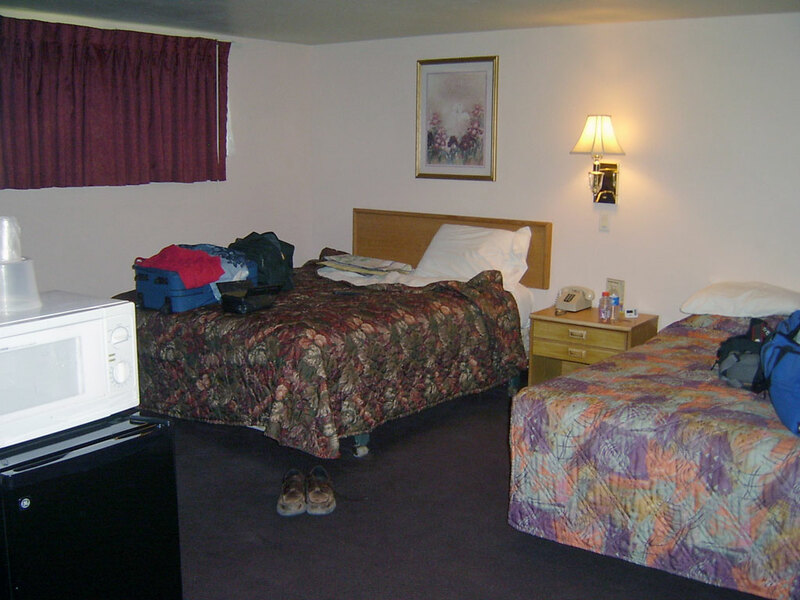 The Glenwood Motor Inn was nowhere near as fancy as the Hot Springs Lodge. Room #215 was missing a few light bulbs and the decor was out of date ten years ago, but I was too tired to care. Those problems paled in comparison to the world’s most uncomfortable shower. I had hoped a shower would be relaxing, but it had the opposite effect. The water felt like thousands of needles raining upon my skin; it was pure torture! The room was clean but did not have much else going for it. There wasn’t even an alarm clock. We ate a late dinner at the Village Inn directly across the street from our hotel. By this point in the trip, dad and I were getting on each other’s nerves. We went swimming, biking, and hiking in the same day; this was more like a freaking triathlon than a vacation! I went to bed wondering if my old man has a hyperactive thyroid gland or something. Ah, the last day of the trip. We got up early and ate breakfast on the road as we left Glenwood Springs. I reflected all of the things I didn’t miss about home as I munched on my Burger King hash browns. 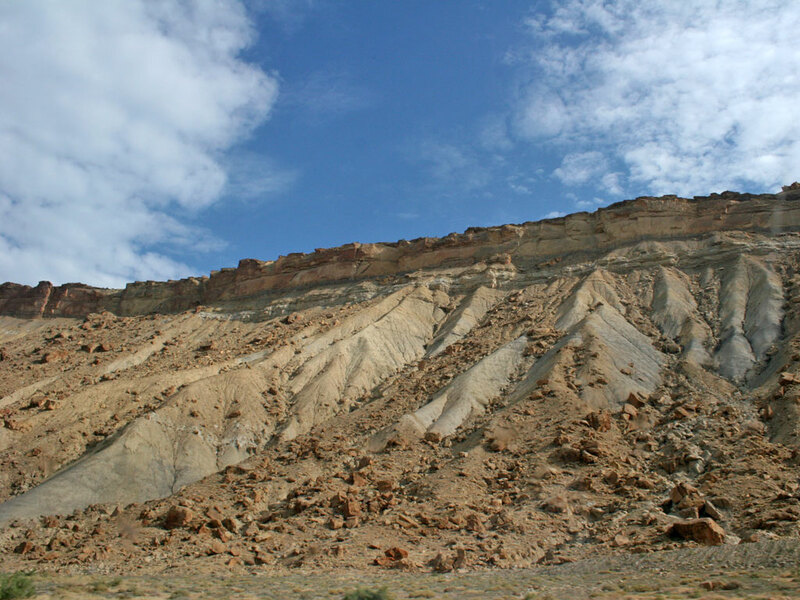 Rather than going home the same way we got there, we took Interstate 70 through Grand Junction. Dad wanted to stop at the casino on the way home but I talked him out of it. We ate breakfast at Burger King, lunch at Taco Bell, and dinner at McDonalds. My poor arteries! We made it back to Phoenix in one day because we stopped only to refuel and eat. The only picture I took on the way home was of the weird landscape along Interstate 70. We changed drivers a few times. We got home before the sun went down and I slept in my own bed that night. Overall the trip was pretty cool and I’m glad I went. 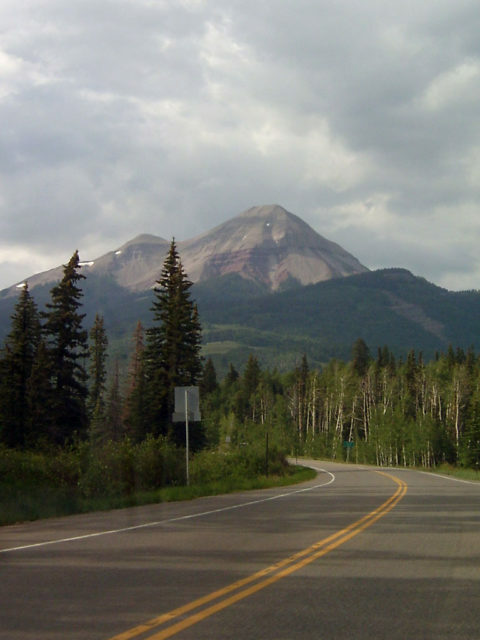 My favorite part was the driving, especially along the road from Durango to Silverton. I thought Ouray was neat, too. 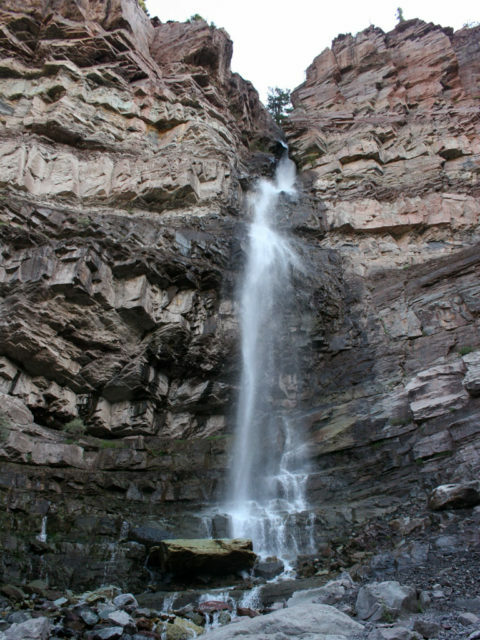 Colorado has a lot to offer the outdoorsy, adventurous type of person. I hope that someday I will have time to go back and actually enjoy Colorado on my own terms without being pressured to rush off to the next adventure.